AMBUCS Volunteering Event | Spiros Law, P.C. Over the weekend, our team was happy to spend our time volunteering at the Challenger League Baseball series, hosted by the AMBUCS organization in Danville. 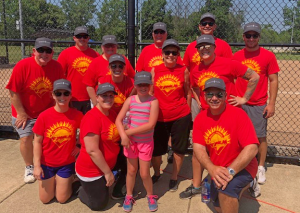 This game series, hosted every June, is just one of the ways that AMBUCS helps improve mobility for people with disabilities. At the game, each of our twelve volunteers paired up with a buddy whom we spent the day getting to know. We got to help our buddies as they played the field, hit the ball, and ran the bases. Since our buddies aren’t usually able to play a game like baseball, they had a great time, and so did we! To read more about this event and the organization, visit the AMBUCS website.